I would like more information about 15000 Altata Dr, Pacific Palisades, CA 90272 MLS #19441986. 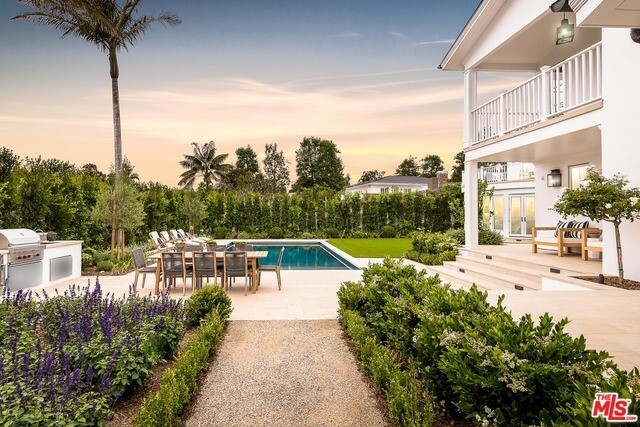 Set upon a rare 15, 000 square foot lot in the ever-coveted Huntington neighborhood of Pacific Palisades, this Contemporary Traditional home marries the charm of its 1930s architecture with impeccable coastal-inspired modern flair. Set back from the street with manicured landscaping, the newly renovated 5-bedroom home invites one inward through the foyer to the spacious living room and sunroom with walls of windows. The chef's kitchen and family room with glass French doors open unto the home's expansive backyard, complete with a patio, pool, dining area and BBQ to revel in year-round entertaining. The second floor master suite features a spa-like bath retreat, vast closet space and balcony overlooking the estate's lush exterior. Upstairs, three additional en-suite bedrooms access a comfortable family room. Beautiful detailing throughout, this Palisades oasis pairs chic design with an authentically soulful ambiance, all in a matchless L.A. locale. The property on 15000 Altata Dr, Pacific Palisades, CA 90272 is listed for $9,950,000 as MLS #19441986. This 5 bedroom, 7 bathroom sqft Single Family Residence built in 1932 located in Pacific Palisades, CA 90272. For more information regarding this or any other property in Pacific Palisades, please contact us at (424) 272-1339.